Today, Tesla released the outline of a new compensation plan for CEO Elon Musk, which envisions the company growing to a market capitalization of $650 billion. The main takeaway is that Musk plans to take a $0 annual salary, and will only get paid in stock options that depend on Tesla hitting certain market value milestones and financial targets. This sounds audacious, but in reality, Musk could end up walking away with billions of dollars. Tesla summarized Musk’s pay plan that’s a “100 percent at-risk performance award, which ensures he will be compensated only if Tesla and all of its shareholders do extraordinarily well.” The plan ties Musk’s pay to hitting certain revenue targets and the market cap—a big departure from his previous compensation plan that focused on hitting certain targets for car output and gross margins. Musk—who’s worth $20 billion, according to Forbes—would receive a 10-year grant of stock options equivalent to 1 percent of Tesla’s total outstanding shares for each milestone that’s hit. The top achievement, according to the plan, is to grow Tesla’s market cap tenfold to $650 billion by 2028, in which Musk would net around $55 billion. Tesla’s statement makes clear, however, that figure could be diluted due to employee stock awards or if the automaker acquires companies in the future. If the plan seems wild, it is—but here’s three scenarios under which Musk earns more than $0. In some cases, a lot more. The stock options are split into 12 tranches, which begin once Tesla hits a market cap of $100 billion. From there, it increases in $50 billion steps, up to the $650 billion target. At the same time, however, the company needs to hit operational milestones that begin once it generates $20 billion of revenue annually. 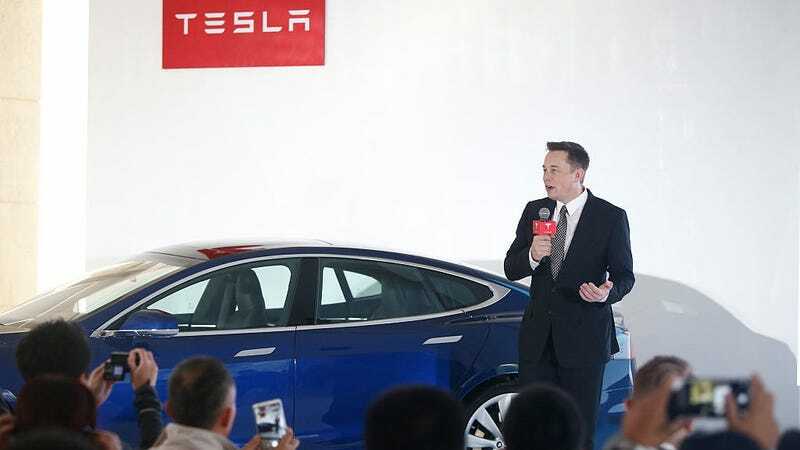 From there, according to an outline from Tesla, the revenue milestones increase to $175 billion. There’s also a milestone that starts when Tesla earns $1.5 billion in earnings before interest, taxes, depreciation and amortization. Put simply, that’s a tall order to fill. For context, Tesla only made $7 billion in revenue in 2016. And Tesla’s worth about $59 billion today. That’s probably why Musk was blunt about his potential prospects 10 years from now: he told The New York Times, “If all that happens over the next 10 years is that Tesla’s value grows by 80 or 90 percent, then my amount of compensation would be zero.” Which is pretty wild. That means he can’t just go out and gobble up a bunch of companies to grow Tesla’s market cap, thereby positioning the company to reach that massive valuation target that would put it in line with the lines of Apple. He needs to be able to create a business that starts generating serious revenue. But, if Tesla nets $20 billion in revenue and the market valuation his $1 billion, that’s when Musk’s options could vest. Tesla has a forthcoming product line that, in theory and if they avoid the production problems that have beset every Tesla product thus far, should help. There’s a new semi, an updated Roadster, a new crossover, a possible pickup truck. Tesla could also grow its solar business. But the company’s still bleeding money, despite promising profitability for years. And it’s struggled to launch production of its first mass market car, the Model 3 sedan, right as the rest of Tesla’s competitors in auto industry ramps up efforts to build all-electric cars of their own. And Tesla only has one factory to speak of right now to build cars (which, to be clear, autos remain the company’s main business); GM has 12 in the U.S.
One possibility that hasn’t really been discussed in light of the news is what happens if Tesla is sold over the next decade. To be sure, it’s a purely hypothetical idea—no one expects Tesla to be put up on the auction block anytime soon—but, in the event it is, Musk has the possibility to make some money far sooner. Tesla explained to me that the operational milestones were eliminated under this scenario so Musk isn’t dis-incentivized from accepting a sale that would benefit shareholders. This isn’t all that strange. If he was disincentivized, that could be what’s known as a “poison pill,” which are designed to prevent hostile takeovers of public companies. “The treatment of the CEO Performance Award upon a change in control is intended to align Mr. Musk’s interests with Tesla’s other stockholders with respect to evaluating potential takeover offers,” Tesla’s outline states. If Musk hits these milestones, he can’t sell his shares for five years, but Tesla’s market valuation has rapidly accelerated over the last couple of years, so it does present a scenario where he could receive a windfall before the 10 year period expires. With that in mind, here’s a fun game to consider: what happens if SpaceX purchases Tesla, or something like that? The possibilities seem endless. The reason why this announcement’s garnering so much attention is that Musk has suggested for years he might step aside as CEO. This plan, essentially, keeps him at Tesla for the next decade. There’s one interesting line from Tesla’s outline that stands out, though: Musk could step down as CEO and serve as both Executive Chairman and Chief Product Officer of Tesla, and still be compensated under this plan. “This ensures that Elon will continue to lead Tesla’s management over the long-term while also providing the flexibility to bring in another CEO who would report to Elon at some point in the future,” Tesla said. Ever the optimist, Musk still sees the windfall laid out in his compensation plan as a huge possibility. “I actually see the potential for Tesla to become a trillion-dollar company within a 10-year period,” he told The New York Times. Tesla’s shareholders still have to approve the plan. Now, we’ll have to wait and see what they say at an upcoming meeting in March.